When I comment on articles about socialism on Facebook or web sites like Christianity Today or Patheos, I often get the response that socialism is just sharing and I wonder where they got such an idea. After all, if you read the writings of the followers of Saint-Simon, Marx, Lenin, Stalin or Mao, none of them mention sharing. Socialism: You have two cows. You give one to your neighbor (share). Communism: You have 2 cows. The State takes both and gives you some milk. Fascism: You have 2 cows. The State takes both and sells you some milk. Nazism: You have 2 cows. The State takes both and shoots you. Bureaucratism: You have 2 cows. The State takes both, shoots one, milks the other, and then throws the milk away. An American Corporation: You have two cows. You sell one and force the other to produce the milk of four cows. Later, you hire a consultant to analyze why the cow has dropped dead. A French corporation: You have two cows. You go on strike, organize a riot, and block the roads, because you want three cows. A Japanese Corporation: You have two cows. You redesign them so they are one-tenth the size of an ordinary cow and produce twenty times the milk. You then create a clever cow cartoon image called ‘Cowkimon’ and market it worldwide. A German Corporation: You have two cows. You re-engineer them so they live for 100 years, eat once a month, and milk themselves. An Italian Corporation: You have two cows, but you don’t know where they are. You decide to have lunch. A Chinese Corporation: You have two cows. You have 300 people milking them. You claim that you have full employment, and high bovine productivity. You arrest the newsman who reported the real situation. 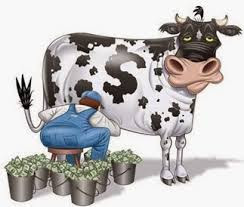 Clearly, milk cow economics is humorous and based on stereotypes. But why are the definitions of capitalism and socialism always the least funny? That’s because the authors intend to make socialism look much better than it would if people knew the histories of Nazi Germany, the USSR, China under Mao, North Korea, Cuba, etc. The creators of socialism, beginning with Plato, intended to perfect human nature through the elimination of private property, equalization of wealth and state regulation of daily life. In trying to accomplish their goal, they murdered about 100 million people in the 20th century. That makes the socialist joke about sharing even less funny. Not only is socialism not about sharing, but sharing is a capitalist gesture because in order to share something you have to own it. If my friend on the playground has no candy bar and I steal one from a guy who has two to give it to my friend, that’s not sharing. That’s just theft. It’s no different if the state does the stealing. There have been many varieties of modern socialism since its birth in early 19th century France by Henri Saint-Simon. Bismarck’s “welfare” state was the first manifestation. Then came Marxism, Leninism, Mussolini’s fascism, democratic, Fabian, Maoism, and others. What the all have in common is 1) centralized decision making in the state, 2) opposition to any institution other than the state, such as churches and families, and a hatred of traditional morality. Communitarianism was an attempt by Christians to force families and churches back into the socialist mold. Most socialists today object to characterizing socialism as that system practiced under Hitler or Mao. That’s fair. They don’t know it but they desire the first modern implementation of socialism known as Bismarck’s welfare state which morphed into Europe’s democratic socialism. However, they need to know that in some ways the US is more socialist than Europe. For example, our income tax code is much more “progressive,” that is, socialist, than Europe’s and we send a higher percentage of our student population to college. Our poor people are close to middle class in many European countries and unemployment is much higher there. Adding paid family leave and free healthcare for everyone would make us more socialist than any democratic socialist nation in Europe. But the “free” healthcare has costs most American won’t find acceptable, such as denial of care that most Americans take for granted as well as waiting periods so long that some people die before they get the “free” care. We have a lot of work to do in teaching people the reality of socialism and what true sharing is, not to mention the real meanings of justice, charity, liberty and the many other words in the English language that socialists have made meaningless.